My son is turning one this month. His birthday is a multi-themed celebration. A year ago, we were both in critical care fighting for our health and our lives. So, 12 months later, we are celebrating being healthy, happy and having access to health care. Every minute, a woman dies of complications related to pregnancy and childbirth. This adds up to more than 500,000 women annually. While 99 percent of all maternal deaths occur in developing countries, the United States is ranked the worst developed country for maternal health, with one in every 1,800 American women at risk for maternal death. Therefore, this is an "everywhere" issue. 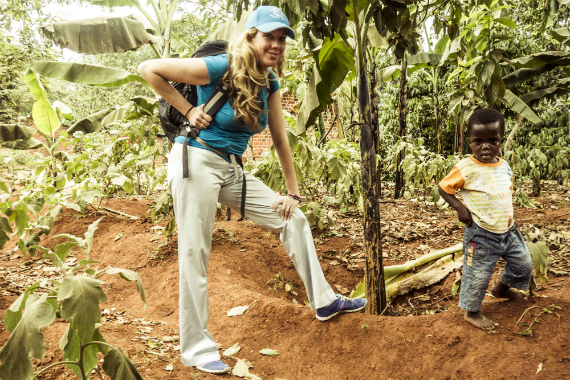 Elizabeth Gore travels with the United Nations Foundation in Bussi Island, Lake Victoria Uganda. February 19, 2014. These statistics resonate with me on a deeply personal level. I've traveled all over the world, with the Peace Corps, the United Nations Foundation, and now Dell, and I've seen countless girls and women who don't have access to adequate health care. My own scare with my pregnancy and birth brought the weight of this issue crashing down on me and my family. There's no doubt in my mind that I wouldn't be writing this story today, and my son wouldn't be here either, if I had been in their shoes. Words can't accurately express how strongly I feel about the dire need for improved access to maternal care. The U.N. has had several huge successes with Goal 5, which is a major initiative dedicated to improving maternal and child health globally. Thanks to the U.N.'s work with its partners, maternal deaths worldwide have dropped by 45 percent since 1990, and skilled-health personnel assisted more than 71 percent of births worldwide in 2014, up from 59 percent in 1990. These advances are more than just impressive -- they're imperative. Pregnancy is the leading cause of death for females between ages 15 and 19. We can use technology, partner with the U.N., and change these stats! It goes without saying that the success of Goal 5 is a critical part of our future. Girls are the bright, shining force of our next 15 years. They'll build businesses. They'll innovate. And they'll put 90 percent of their earnings right back into their communities. Clearly, maternal and child health is more than just a women's issue. It's everyone's issue. The strides the U.N. has made in the past 25 years came from a multifaceted approach. For years, the U.N. has supported a range of programs and technologies geared toward helping girls. One of my favorite initiatives is Girl Up, by the UN Foundation, which empowers teenage girls to become leaders, and to raise money and advocate for girls overseas who are marginalized. Since 2010, Girl Up has raised millions of dollars for U.N. programs that give girls in developing countries the opportunity to go to school, see a doctor and stay safe from violence. Girl Up's success is predicated on the technology platform that enables the interaction between the girls, as well as the flow of aid. Girl Up has also pushed policy changes in nations such as Ethiopia, Guatemala, Liberia and Malawi. In February 2015, Malawi passed a law that raises the legal age of marriage from 15 to 18. In Liberia, lawmakers passed The Children's Law, which offers girls protection from child marriage and provides victims of domestic abuse with increased support. These policy changes wouldn't have happened without Girl Up's support. In terms of technology supporting the health of women and girls, there's RapidSMS, a diverse tool UNICEF developed for anyone with a mobile phone. The simple SMS text-message program provides all kinds of resources -- it has been used to register more than seven million births in Nigeria over the course of 15 months and has provided information on prenatal care to thousands of pregnant women across Rwanda. Technological solutions don't always have to be advanced or expensive to make an impact. Sometimes an SMS text message is all it takes to ensure women have the right information at the right time. With a whopping 6.8 billion cell-phone subscriptions worldwide, it makes so much sense to replicate a program like this in other nations. In another tech-focused example, solar-powered suitcases helped doctors in Nigeria save mothers and deliver healthy babies. Nigeria is considered one of the 10 most dangerous countries in the world for a woman to give birth. To make matters worse, electricity is unreliable, and as a result, medical procedures are often compromised or delayed until daylight. But these relatively simple solar-powered kits by We Care Solar, which come with efficient medical lighting and power for mobile communication, laptops, and small medical devices, have saved countless lives and quelled the fears of so many expecting mothers. The applications for a low-tech, inexpensive solution like this are endless, especially in developing countries. With simple technological solutions like RapidSMS and We Care Solar kits and programs like Girl Up, if the U.N. keeps this momentum going, I'm confident that they will meet their goal of reducing maternal deaths by 75 percent by the end of this year. That will be an incredible feat, but I'm sure the organization won't stop there when it comes to improving maternal mortality. On the birthday of my son, I've learned firsthand, it doesn't matter whether you're a woman in a refugee camp or a woman in Silicon Valley -- improved maternal health should be everyone's concern. We need initiatives like Goal 5 to empower women to make important choices for their health, families and children. In the end, giving women the power to take hold of their own futures unlocks their true potential to change the world. This post is part of a series produced by The Huffington Post, "What's Working: Sustainable Development Goals," in conjunction with the United Nations' Sustainable Development Goals (SDGs). The proposed set of milestones will be the subject of discussion at the UN General Assembly meeting on Sept. 25-27, 2015 in New York. The goals, which will replace the UN's Millennium Development Goals (2000-2015), cover 17 key areas of development -- including poverty, hunger, health, education, and gender equality, among many others. As part of The Huffington Post's commitment to solutions-oriented journalism, this What's Working SDG blog series will focus on one goal every weekday in September. This post addresses Goal 5.